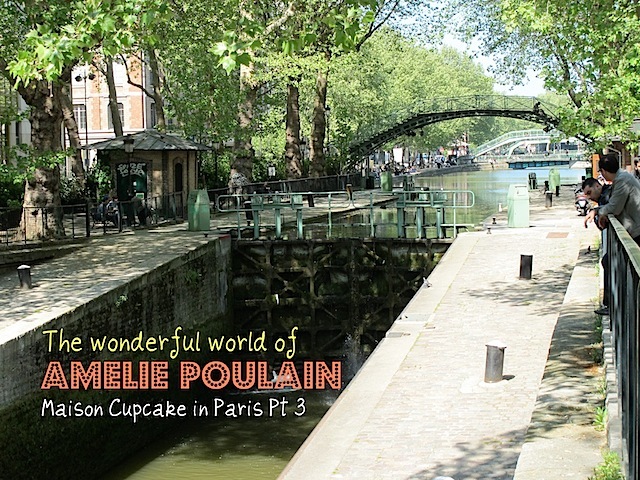 This post was previously published at Maison Cupcake. This is the last of my three part series about last year’s spring trip to Paris. After viewing Paris through the eyes of Simone de Beauvoir last week, today it is the turn of Amelie’s Paris, Amelie Poulain as in Le Fableux Destin de Amelie Poulain – to give Jean-Pierre Jeunet’s film comedy its full title! At the time of filming, the Canal St Martin in north east Paris was a fairly dingy area however it’s now smarter and artier a la Portobello or Hoxton. French canals are over twice the width of those in the UK and the banks were lined with office workers eating their lunch in the leafy surroundings. Barge trips sail up and down although there is a tunnel close to where this photo was taken preventing them going any further south. The Metro features frequently in Amelie. There are many differences between the Paris Metro and London’s Underground; stations are closer together and often only just below the surface (like the Circle Line); platforms face each other rather than having their backs to each other meaning you can see people on the platforms opposite and it’s less closed in. The passageways of the Metro are echoey and like Amelie, you often hear music from buskers coming from far away. We took the metro from Canal St Martin to below Sacre Coeur; scene in the film where Amelie arranges to meet Nino but only communicates with him via public telephone boxes. A funicular railway transports you from this level to the top where it’s a short walk to Montmarte. Montmartre is like a village on a hill. It feels separate from Paris yet is quintessentially Parisian at the same time. On such a sunny day, lighting was very harsh to take pictures from our cafe and I must confess I was wilting somewhat in 27c heat. (I would be hopeless anywhere hotter). I had hoped to walk to the Moulin Rouge or better still, photograph it at night but alas, with sore feet we consoled ourselves with this windmill, one of several which used to dot the Montmartre hill. This Amelie pilgrimage was impromptu, hence I had not researched where the famous bar was located. This grocery store however featured prominently in the film and even displays an Amelie poster on the corner! Small pleasures in life are a recurring theme in Amelie, the crack of caramel on a brulee, plunging a hand into a sack of lentils. Our small pleasure in Montmartre was watching crepes being cooked on this iron. Un fableux ice cream parlour! Having walked from Montparnasse to Montmarte with only a brief 4 stop hop on the Metro, we crawled down Montmarte to our final Amelie moment of the day. Abbesses Metro station is one of only a few retaining its original Art Nouveau canopy. It’s also the station to which Amelie escorts the blind man in the film. Being built into the side of the hill, it’s a rarity in Paris that you have to descend deep to the platform. Never had I been so glad to sit down! Exploring cities in hot weather is thirsty work.